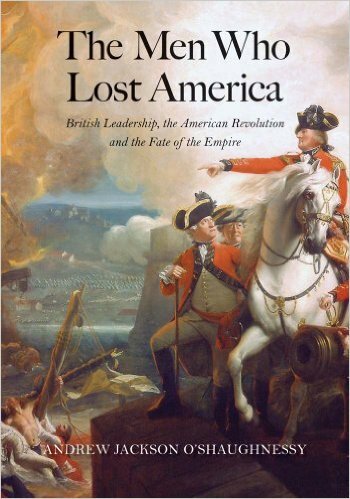 The Men Who Lost America by Andrew Jackson O'Shaughnessy delves into the British side in the American Revolution. O'Shaughnessy is a historian and a member of the Royal Historical Society. The book examines ten men who were instrumentally important to the British war and political effort. The work is broken into parts, and each part examines a different man. The most notable person covered is King George III, whose short biography highlighting the American Revolutionary War years is outstanding. Other subjects include Lord North, George Germain and William Howe, to name just a few. I believe that this is an important book for anyone, but particularly for Americans who are interested in the American Revolutionary Period. I note its importance to readers on my side of the Atlantic because, after a lifetime of reading about this subject, I can attest to the fact that finding works from the British point of view is difficult. The books by American historians that mainly focus upon the American perspective have not demonized the British or their leaders. However, these works are often critical of British leadership in ways that seem to exhibit a bias. English military and political leadership is sometimes portrayed as semi-competent and as mediocre leaders. Their errors and foibles are emphasized while their strengths and virtues are downplayed. Reading this book has helped to highlight this bias for me. "The British commanders and politicians were discredited not least because their enemies triumphed and their opponents wrote the histories. This was equally true in Britain, where the view that America was lost by incompetent leadership began during the war and became the popular orthodoxy in the immediate aftermath. When in 1792 one of the earliest British consuls to the United States met President George Washington, he reported home that Washington was “a great man . . . but I cannot help thinking, that the misconduct of our commanders has given him the principle part of that greatness.” Until well into the twentieth century, British historians portrayed George III and Lord North as enemies of progress who secretly conspired to introduce an unconstitutional despotic form of government in both Britain and America." In contrast to many other accounts that I have read, this book portrays many of these men as being both competent and honorable. They are also to a great extent, portrayed as intelligent people who understood both balanced government and liberty. Several of them believed that defending the British system of balanced government, which was a system that did protect many individual freedoms, was the best way to promote liberty. "The men who lost America were not opponents of liberty and representative government. Far from conspiring to establish tyranny in America, they regarded themselves as defending liberty and the rule of law that they believed could be safeguarded only by upholding the supreme authority of Parliament"
"The British politicians and commanders were not ignorant bigots. They were conversant with the Enlightenment emphasis on rational thought in an era that prided itself on being an “Age of Enlightenment.” "
I must add, however, that the men described in this book were all complex and had different beliefs, philosophies and experiences. Thus, it is difficult to generalize too much about them. This work also provides valuable insights into the inner workings of the British government of the time. It delves into both the intricacies of the British Cabinet as well as Parliament. Furthermore, as the American Revolution turned into a global conflict with the entrance of France, Spain and the Netherlands into the war, the author highlights political, military and social activity that occurred in such diverse locations as the Caribbean, Central America, The Mediterranean, India and more. This is also a subject where information is scarce on this side of the Atlantic. This is an extremely enlightening and enjoyable history. For many people who have read mostly American accounts of the conflict, it will be especially insightful. It has whetted my appetite to read more about this side of the Revolution from non-American perspectives. This book is highly recommended for anyone interested in the American Revolution or in this period of history. The controversy around traditional books verses eBooks is one that raises emotions akin to differences surrounding such hot button issues as religion and politics. 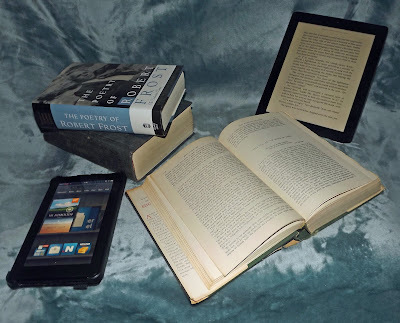 Having jumped into the world of digital books approximately three years ago, I have formed definite opinions on the issue. As it involves new technology bumping into an ancient human activity, namely reading, the topic is tied to the profound changes that the digital age is having on humanity. I think that in regards to this subject, a few points relevant to the history of books are important to keep in mind. When the printing press first became popular in the fifteenth century, folks, mostly scholars, protested that the new machines produced books of much lower quality than handwritten tomes. In the twentieth century, when paperbacks first became popular, there was protest over their low quality as opposed to hardcovers. First, of course, this history illustrates that changes in the way that we read books are commonly resisted as folks defend the old ways. I am not completely dismissing the above arguments. After all, I think that it could be argued that aesthetically, handwritten tomes were far superior to printed books or, more importantly, that mass-produced paperbacks lack many of the merits of hardcovers. I would contend that we place too much value on cheap paperbacks and lower quality hardcovers. I do not see all that much tactile or aesthetic appeal to these lower grade books. Much has been said and written about sensory satisfaction gained with physical books. People often comment upon the perceptible sensations associated with them. Some even remark about their aroma. But when it comes to paperbacks, I question the value of the experience imparted. I am so much more appreciative of the positive sensations garnered with higher quality, more substantive books. If one wants to fight for traditional books, I say make it about quality books that are worth it. Of course, for a personal collector, the issue of cost comes into play. I fantasize about a library of high quality hardcovers. A perusal of such books online indicates that price escalates with quality. For someone such as myself who likes to delve deeply into books, the benefits of eBooks are immense. I can, and do, take numerous notes and make comments, as well as highlight passages. This would destroy a conventional book. 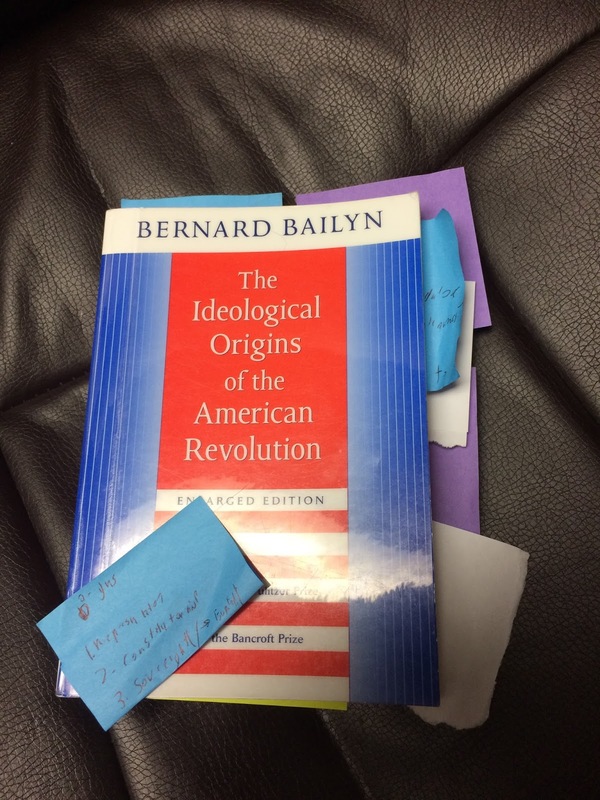 I recently did read an old-fashioned book, and I filled it with post-it notes in lieu of the electronic notes that I am now used to. Likewise, the copy and paste function is invaluable for bloggers and others who need to use quotations from a book. As I do look up unfamiliar words, the dictionary function is very convenient and useful. I even use the word search, which is better than an index. Of course, particularly with history books, my ability to search the web for additional information, maps, charts, etc., greatly enhances my reading experience. I have also shifted to a system of just in time buying of books. Instead of hoarding tomes, some of which I will likely never get to in my entire lifetime, I now download the instance at which I am ready to begin a new read. With all of that, I do not discount the value of traditional books. I have made several references to quality hardcovers. I believe that these may represent the future of conventional books much like vinyl records have made a comeback among folks who enjoy collecting music. I think that it is a good bet that eBooks will eventually replace soft covers. I am aware that sales of old-fashioned books have stabilized, but as digital book technology continues to get better and more economical, I would surmise the erosion in paperback sales will commence again. I do have a vision of my fantasy library. It would be filled with the high quality hard cover tomes. Though I already own a very few of them, cost has sadly prevented me from embarking upon any real collecting. I wonder, however, if I did possess such an impressive library, if the great books would still sit on a shelf while I read digital versions of them. There are just too many advantages to eBooks! I recently read a traditional book. I have become so dependent on note taking this was the shocking result. If one considers the history of positive human progress, such progress is often aided by advances in communication. EBooks are part of the larger digital evolution that allows folks to instantly communicate with one another and to access vast reservoirs of human knowledge. Digital books give us access to millions of books, relatively cheaply, at the press of a few points on a keyboard or screen. They add to our ability to cross reference information and utilize words much more easily than ever before. These advantages cannot be overstated. In my opinion, this will only enhance the spread of knowledge and ideas, which has traditionally led to great benefits for humanity. I do know that many of my readers will disagree with many of my points here. Folks are understandably attached to old-fashioned books. For me, the real virtue of a tome is its contents, not its package. However, I do place great value in the kind of traditional book that I think deserves to be valued. Nevertheless, I would argue that anything that makes the contents of books more accessible, understandable and interactive is a really good thing. 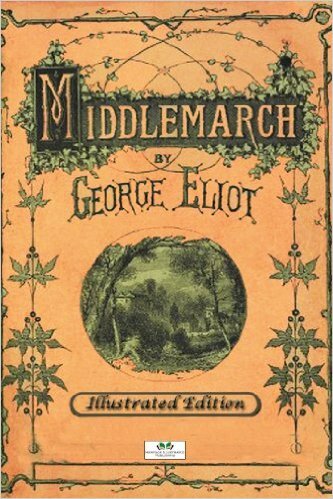 Middlemarch by George Eliot is an extraordinary novel. The book has so many plot threads, major characters and significant themes that I struggled a bit when it came time to choose the content of this post. The fact that the novel is so famous and so much has been written about it only exacerbated my difficulties as I strove to say something different about it. The book’s themes include the role of women in society, an exploration of provincial versus cosmopolitan thinking, the degeneration of marriage and relationships, serious musing on art and aesthetics, fate versus free will and many other topics. The primary narrative focus, more or less, is on Dorothea Brooke, later Dorothea Casaubon. A pious and strong willed young woman, Dorothea strives for a meaningful life. She endeavors to be the ideal woman. An ideal woman, the narrative reminds us, is someone like St. Theresa who sacrificed her life for Christian ideals. Another plot thread involves Tertius Lydgate. He is a doctor who champions progressive forms of medical care. As the book progresses, he woos and subsequently marries Rosamond Vincy. As Lydgate falls into debt, the couple’s home life becomes acrimonious. Fred Vincy is Rosamond’s brother. This young man is earnest but irresponsible. His attempted courtship of Mary Garth, another young woman with a strong personality, weaves another thread into the narrative. As the story progresses, the various plot threads intersect and play important roles in the various themes that are embodied within this book. There are fans of this novel who contend that it is the finest ever written. While I would not go that far, in my opinion, it is among the finest. It has strong and complex characters, a compelling and interesting plot, fascinating themes, some of which touch upon the most basic and important elements of human existence. I also found Eliot’s writing to be suburb. It is down to earth at times; at other points, it is sublime. All of this combines into a wonderfully brilliant, aesthetic package. As I do with many complex works, I am going to concentrate on only one of the many interesting aspects of Eliot’s work. In this novel, Eliot masterfully describes how the warmth of love can degenerate over time. The author looks at two separate couples, Dorothea and Reverend Casaubon, and Lydgate and Rosamond. Dorothea and Casaubon are each impressive and nuanced characters in and of themselves. Their pairing adds intricacy to their respective complexities. Upon meeting Casaubon, Dorothea is immediately drawn to his religious intellect and conviction. Though he is stodgy, bookish and much older than her, Dorothea sees him as a perfect life partner. The two quickly marry. However, Casaubon’s relative mental isolation and lack of warm emotions, as well as his inability to connect to Dorothea, cause friction. Casaubon’s somewhat understandable jealousy of the budding friendship between Dorothea and Will Ladislaw compounds the problem. Eliot’s depiction of how the relationship goes from unquestioning love to acrimony is brilliant. Dorothea slowly comes to realize that she is looking for things in Casaubon that he is not giving her. Though one clearly senses that Eliot’s sympathies lie with Dorothea, Casaubon is not portrayed as a monster. In fact, Dorothea is shown to miss certain aspects of his inner self that could have helped ameliorate the couple’s problems had she been sensitive to them. She was as blind to his inward troubles as he to hers; she had not yet learned those hidden conflicts in her husband which claim our pity. She had not yet listened patiently to his heart-beats, but only felt that her own was beating violently. Dorothea’s evolution from near worship of Casaubon to a kind of wary cynicism is believable and complex, as well as interesting. The other couple, Lydgate and Rosamond, is almost as interesting. The pair quickly falls in love and marries. However, with time, rancor develops between the two. Lydgate is a man of scientific curiosity who enjoys experimentation. The materialistic Rosamond soon becomes bored with him and his interests. She begins to flirt with various men. When the two begin to fall into financial difficulties, the narcissistic Rosamond resorts to subterfuge in an effort to thwart Lydgate’s attempts to curtail their expenditures. As with Dorothea and Casaubon, Eliot adds a lot of complexity to this relationship. Though the author seems to mostly sympathize with Lydgate, the Doctor is shown to have shortcomings too. He seems completely unable to see things from Rosamond’s point of view and begins every conflict by eschewing all compromise. Though he cannot dominate or control Rosamond, it is clear that he would like to. Once again, Eliot is at her best when she portrays the erosion of this relationship. The way that Rosamond transforms from a loving bride to an uncaring, deceptive and narcissistic wife is portrayed with great literary skill. A vicious cycle is illustrated. As Lydgate’s troubles mount, Rosamond reacts with less sympathy and more criticism. Thus, Lydgate begins to confide in her less and less and begins to keep things from her. As Rosamond realizes this, she becomes even more embittered. There are many common themes shared by both of these relationships. Each involves two people who have trouble understanding each other’s feelings. Even if one looks at Dorothea and Lydgate as the more sympathetic members of the marriages, each of them has trouble understanding the inner life of their respective mates. Both relationships begin warmly and gradually degenerate into misunderstandings, lost opportunities to connect, selfishness, etc. All this is portrayed believably and with complexity. The flaws in these relationships tie into what seems to be a major theme of this novel, that is, the harmful effects of people not being able to see things from other people’s point of view. These two marriages end up in very bad states indeed. In contrast to what one would likely expect in a novel set in modern times, divorce was not an option for these characters. This changes the entire dynamic of the situation. In the world of the nineteenth century, there is no escape from the other person. Obviously this has an effect upon the feelings and the behaviors of the characters. At one point, Lydgate contemplates the bad direction that his relationship with his wife is going in and is apprehensive as to the result of further deterioration. It was as if a fracture in delicate crystal had begun, and he was afraid of any movement that might make it fatal. His marriage would be a mere piece of bitter irony if they could not go on loving each other. Eliot’s depiction of these relationships heading into trouble is simply brilliant. They are believable, complex, and while at times painful to read about, have great aesthetic value. This is but one of many reasons that Middlemarch is truly a great novel.